Xiaomi Redmi 6 Pro comes with Metal body compared to Polycarbonate on Redmi Y2. Redmi 6 Pro has a 5.84-inch (2280×1080 pixels) Full HD+ 19:9 display whereas Redmi Y2 has 5.99-inch (1440 × 720 pixels) HD+ 18:9 display both phones are powered by Octa-Core Snapdragon 625 processor with 3/4GB of RAM and 32/64GB of internal storage and support for dedicated MicroSD card slot. Both phones have 12+5MP Dual Rear Camera, Redmi 6 Pro has a 5MP front facing camera whereas 16MP front camera on Redmi Y2. Both phones have a portrait mode, EIS can record FullHD Videos. 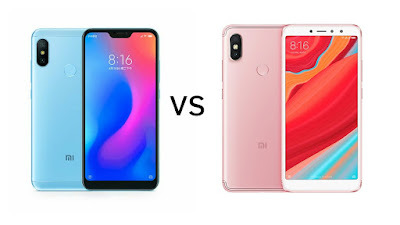 Redmi 6 Pro has 4000mAh battery compared to 3080mAh battery on Redmi Y2.